Spotify picked up around two million paying premium customers in the United States during Q4 2018, the Consumer Intelligence Research Partners (CIRP) estimates. CIRP also claims that during the fourth quarter 18% of those who used Spotify via the ad-supported platform started a 30-day free trial for the premium service. 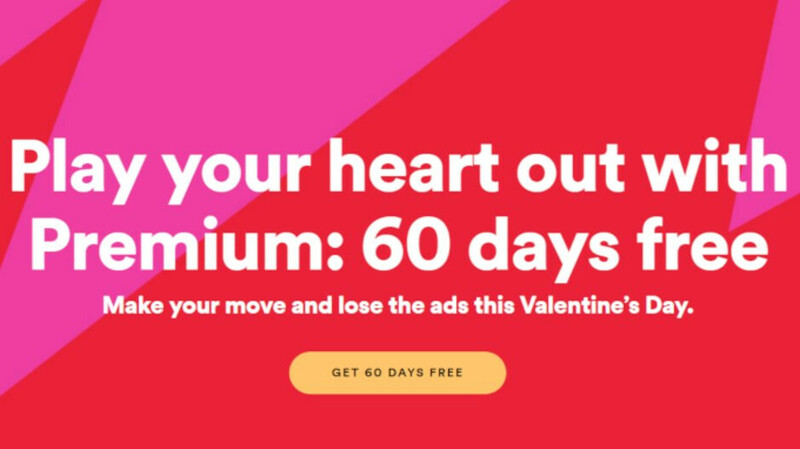 However, the number may increase in Q1 2019 since Spotify is currently running a Valentine’s Day promo that allows new customers to enjoy 60 days of premium service for free rather than just 30 days. After the 60-day Spotify Premium trial, you'll be required to pay $9.99 per month to continue to use the streaming service. Of course, the deal looks quite interesting, not just because it will save consumers an extra $10, but they will also have more time to decide whether or not it's worth paying for the premium subscription after the trial expires. We've been able to track the deal in Canada and the United States, but it might be available in other countries as well. There's one downside to this promo: if you have subscribed to the Premium or Unlimited service or have taken a trial offer previously, you are ineligible for this offer.